If you’re anything like me, every now and then a book comes along and totally reshuffles your TBR list. This happened to me last week when I walked into Barnes & Noble (I JUST WENT IN FOR COFFEE AND TO DO SOME WRITING I SWEAR) and saw a stand of brand-new hardcovers copies of The Silkworm, basically screaming at me. Now, let’s get one thing straight: I am not a blind follower of J. K. Rowling. 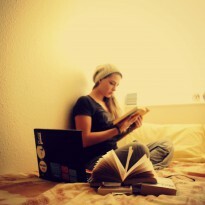 I think she really is a talented writer, but like any writer she has strong moments and weaker ones. The whole Jesus – I mean, Harry – dies and comes back from the dead because he sacrificed himself thing? Not my favorite. Um, spoiler alert, I guess, but if you haven’t read Deathly Hallows by now, honestly what have you been doing with yourself? Anyway. The point here is that even though J. K. will always have a special place in my heart, I can still be a (reasonably) objective judge of her work. So The Silkworm. It’s the followup to Rowling’s crash-bang surprise detective novel The Cuckoo’s Calling (brief review of that here), which surfaced a year or so ago and introduced the literary world to Cormoran Strike, our disgruntled, one-legged PI. In my original review of Cuckoo, I mentioned that I had one big lingering question at the end, which was basically about the killer’s motivation (not his/her motivation to commit the murder, but to do something else totally nonsensical at the beginning of the book). I can’t tell you what specifically didn’t make sense without spoiling things, but at the end of Cuckoo, which was otherwise a pretty decent book, I was just going, WAIT WHAT WHY WHY WHY, which is not a feeling you really want to leave a reader with. 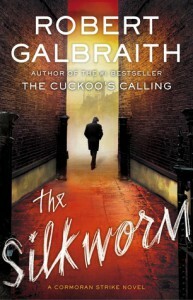 Rowling/Galbraith manages to avoid that pitfall in Silkworm. If anything the killer’s motivation is a little too clear, a little too cut-and-dry (possibly because it’s all left up to Strike’s interpretation and the baddie never gets to speak for him/herself), but I’d rather that than confusion. Overall, though, the story is well-crafted and compelling. Rowling’s insight to the literary world is clearly at work and undoubtedly fascinating to any aspiring author – and probably anyone with a keen interest in books. But as usual, where Rowling really excels is in her characterization. The cast of The Silkworm is colorful and engaging and operating with a wide variety of conflicting motivations, which nearly always makes for good reading. Perhaps the most interesting moment of the book comes when Strike wonders why on Earth he decided to take this case in the first place, when the client is clueless and difficult and may not even be able to pay him – and his reason is both touching and really freaking important (I think). I won’t spoil what it is, but keep an eye out for that paragraph if you decide to read this. So here’s what kept this from being a five-star review: As I said before, the villain is perhaps a little too black and white. I can’t get too far into it without giving things away (guys, reviewing mysteries is really hard), but I will say that I honestly found the ‘reason,’ for the killing a bit disappointing. It seemed almost petty, like an easy way out for the author. But I think my biggest issue with it was that it made the villain this completely pathetic, despicable character. As I’ve said time and again, I want a villain that commands my respect. The killer of The Silkworm, in the end, did not. However, it’s still worth a read. Get ‘em while they’re hot. You can find it on Goodreads here.